In its second-generation, Honda has improved the Amaze in almost every way. And then it also has the advantage of being the only diesel CVT in its class. When Honda launched the Amaze in 2013, it was a car of many firsts. It was not only the first compact sedan from the brand but also their first ever diesel offering. Despite venturing into uncharted waters, because of Honda’s image as a trustable and reliable brand, the Amaze was well received, to say the least. It may not have been the segment leader in terms of sales, but the Amaze brought impressive numbers for Honda nonetheless. Of course, in due time its sales became stagnant until Honda brought in the mid-life facelift in 2016. While the refreshed model did the job at the time, newer products from competitors have somewhat overshadowed the Amaze. We recently got our hands on the second-generation Amaze, and it promises to be better than its predecessor in every possible way. The compact sedan doesn’t quite tickle my taste buds – I don’t quite like it for the simple reason that it focuses so much on fitting everything within the bounds of four metres that it becomes oblivious to the very idea of aesthetic appeal. That being said, of all compact sedans on sale, I have always believed the first-generation Amaze to be the best looking of the lot. It looked proportionate and complete, unlike others that seem as if the designer ran out of paper mid-way while sketching. The second-generation Amaze that abides by Honda’s new design philosophy surely looks fresh, but it’s not a looker, in the strict sense of the word. The front as well as the rear look vertically chopped off. 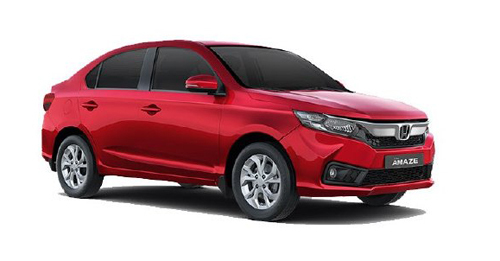 Much like new Honda models, the Amaze gets a wide chrome grille up front is fitted above a honeycomb mesh. Interestingly though, the Amaze looks best in its side profile. We would have liked it better if the alloy wheels were diamond cut. From the rear, it somewhat looks inspired by the Civic hatch sold in the global market, but the Amaze isn’t as sporty or attractive. Overall, while the Amaze doesn’t have a design that will turn heads, it isn’t unstimulating either. Inside, the dashboard is all new – right from the steering wheel to the instrument cluster and the infotainment system. Just like before, it gets a dual-tone beige and black treatment, but instead of the brushed aluminium highlights, this one gets piano black accents. One of the biggest complaints about the first-gen Amaze was the use of poor quality plastics all around. The new model feels a lot better in that regard. That being said, there are a few parts where we could still see a scope for improvement. For example, the plastic panel of the storage space next to the gear lever feels flimsy and the buttons on the steering are too plasticky. Dominating the dashboard is a large Digipad 2.0 7-inch infotainment screen in the centre. The screen resolution is good and the touch interface is responsive too – in fact, the touchscreen felt a lot more intuitive than the one on the Honda City. Although the system works perfectly fine, it looks more like an aftermarket installation as opposed to a factory fitment. From Bluetooth, USB, AUX, navigation to Apple CarPlay, the infotainment system gets it all. Honda has only fitted the touchscreen infotainment in the top-spec variants with the manual transmission option. Speaking of features, the new Amaze gets a lot of safety equipment as standard, including two airbags, ABS and EBD. Honda has also hugely improved the seats of the new Amaze. The front seats of the previous-gen model were thin and uncomfortable over long distances. Thankfully, that has been addressed in this 2018 iteration. The seat cushion is just firm enough for comfort and amply supportive too – under-thigh support for the front passengers could have been better though. A longer wheelbase has also made more room on the inside of the new Amaze – leg and knee room are good enough for comfort. On the flipside, there’s not enough headroom for tall passengers at the back and the seat isn’t wide enough for three adults. Honda will bring in the new Amaze with options of both petrol and diesel engines – both will come paired with a 5-speed manual or a CVT. We started the day by driving the diesel with the manual transmission option. It's the same motor from the earlier Amaze, producing the identical power and torque output. There's barely any poke below 1,500rom, but once the torque kicks in, the car feels relatively eager. It feels best when kept in its mid-range though – there’s enough on tap to gather speed swiftly and maintain it with equal ease. The beauty of the diesel is in its driveability – the torque spread and the ratios are well suited for city and highway duties. The 5-speed transmission shifts perfectly and effortlessly. Our only grouse with this trim is the noisy cabin. Although Honda has worked on the noise insulation, there’s still quite a bit of engine and wind noise inside the cabin, especially at higher speeds. Surprisingly, that isn’t the case with the Diesel CVT, which feels a lot quieter inside. Although in this trim too the Amaze uses the same 1.5-litre motor, it only makes close to 80 horses and 160Nm. And that could be one of the primary reasons for lesser noise inside the cabin. Despite being 20% low on power & torque than the Manual, the CVT doesn't feel like it's struggling to pull the car. In fact, it’s superbly calibrated and shifts between its 7 steps quite seamlessly. Apart from the two diesels, we also got our hands on the petrol manual. The 1.2-litre motor is as refined and noiseless as we have known it to be, but pumping out just 88bhp and 110Nm, the readiness to pull is somewhat missing. Moreover, the fact that it only makes its peak output higher into the rev range doesn’t help the cause either. The Amaze is based on an all-new platform that makes use of high-tensile steel for improved rigidity. In combination with the larger wheels and heavier steering wheel, this endows the car with impressive handling capabilities. The Bridgestone Ecopia tyres, which our test car came fitted with, offer good grip and doesn’t squeal around high-speed bends either. But it’s the ride quality that really impressed us the most. Honda has hit the nail right on the head in finding the right ride-handling balance. From uneven roads to potholes, the Amaze cushions everything just perfectly at slow speeds. Driving over the joints or uneven surfaces on highways, the car sometimes feels a bit bouncy, especially for the passengers at the back, but it settles down rather quickly too. Stopping power comes from disc brakes up front and drum brakes at the back. The brakes are progressive and predictable – you can trust them to stop in time in case of emergencies too. The second-generation Amaze had a huge promise to keep, and by no means does it disappoint. The car has improved in almost every aspect – right from the interior quality and features to the ride quality. However, there’re two things that we wish Honda could’ve offered – a more powerful petrol motor and a quieter drive experience in the diesel. Thankfully, this aspect gets subdued by the easy to drive and extremely affable nature of the diesel engine. Add to that the convenience factor that comes with the CVT, and you have a very comfortable and likable family car in the new Amaze. X-factor: Huge improvements in quality and comfort, which when clubbed with the driveability of the diesel makes the Honda Amaze live up to its name.